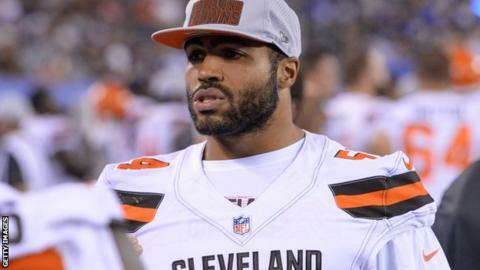 Super Bowl-winning linebacker Mychal Kendricks is facing up to 25 years in prison after pleading guilty to charges of insider trading. Prosecutors said Kendricks made around $1.2m (£0.92m) over two years working with a former Goldman Sachs analyst. Kendricks, 27, admitted that he swapped cash, NFL tickets and access to parties for market-shifting information. He won the Super Bowl with the Philadelphia Eagles last season before joining the Cleveland Browns in June. Kendricks will be sentenced in December. Cleveland terminated his one-year, $2.25m (£1.74m) contract on 29 August, hours after the charges were announced. At the time, Kendricks released a statement in which he said he "deeply regretted" becoming involved with "a former friend of mine who I thought I could trust". He added: "Four years ago, I participated in insider trading. While I didn't fully understand all of the details of the illegal trades, I knew it was wrong, and I wholeheartedly regret my actions. "To this point, I had worked my tail off since I was five years old to become a football player. I was drawn in by the allure of being more than just a football player. "Although I did not take any of the profits for myself, I am committed to repaying all of the funds gained illegally. I accept full responsibility for my actions."